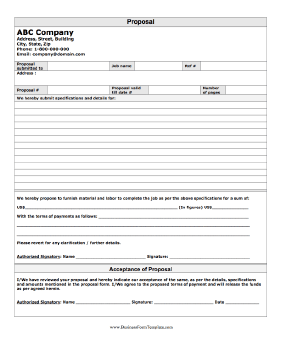 A printable form with lots of rooms for details on a proposal, including projected materials and labor costs and terms of payment. Please revert for any clarification/further details. I/We have reviewed your proposal and hereby indicate our acceptance of the same, as per the details, specifications and amounts mentioned in the proposal form. I/We agree to the proposed terms of payment and will release the funds as per agreed herein.